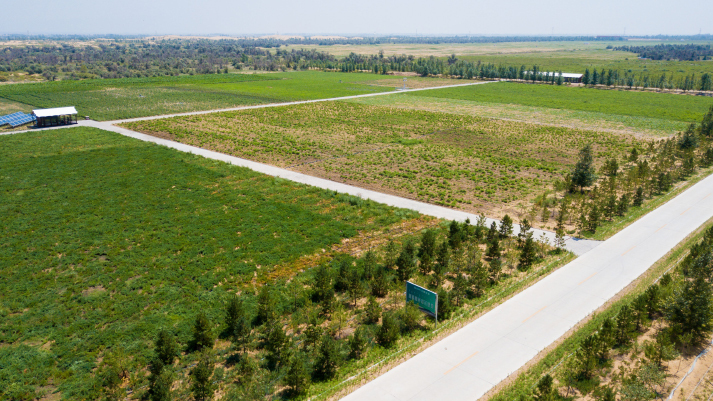 In China's unremitting efforts to fight against desertification, Elion Resources Group, a private enterprise in north China's Inner Mongolia Autonomous Region, is playing an exemplary role. 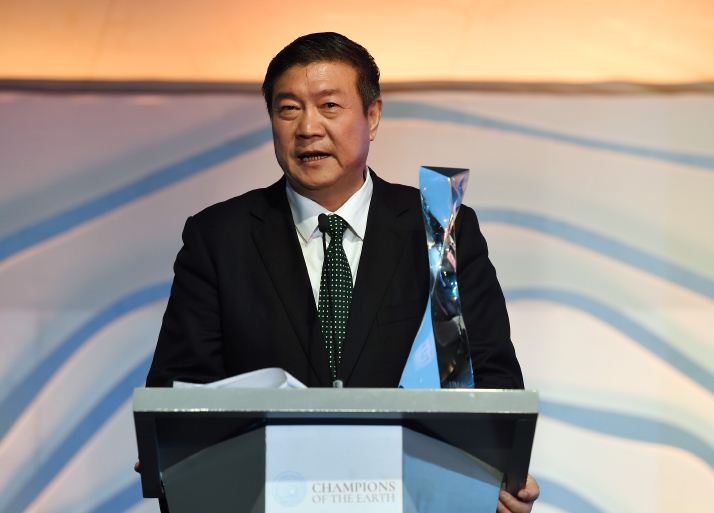 Wang Wenbiao, Chairman of the company, received the Champions of the Earth Award from the United Nations Environment Program (UNEP) in 2017 for his contributions over the past few decades. The following is an edited excerpt of a profile of Wang by Xinhua News Agency. The desert once made the life of Wang Wenbiao miserable, but now, it has made him and other locals rich. Better known in China as the "Son of the Desert," Wang lives in Inner Mongolia Autonomous Region's Kubuqi Desert, the country's seventh largest desert, about 800 km north of Beijing. The constant expansion of the desert has forced many people to migrate, while those who stayed faced poverty and adversity. "Sand and hunger haunted my childhood," Wang said. "Sand was everywhere. When I ate, I tasted sand. When I went to bed, I slept on sand. When I breathed, I inhaled sand." For a long time, his dream was to leave the desert and eat a meal without sand in it. However, for the past 30 years, as chairman of Elion Resources Group, a leading Chinese green enterprise, Wang has dedicated himself to the battle against desertification. However, Wang was first motivated by entrepreneurship rather than altruism. As a government clerk in 1988, he ventured into business and managed a near-bankrupt saltworks on the edge of the desert. Despite the high salt reserves in a lake beside the saltworks, he constantly worried about the company's operations as the desert was swallowing the lake. Wang set up a special fund, where he set aside 5 yuan ($0.73) from each ton of salt sold for afforestation, and dispatched one third of his staff to plant trees surrounding the lake. His plan worked, output increased and the saltworks managed to make a small profit with quick turnover. Since there was no road through the desert to the nearest train station, which was 67 km away, all the salt had to be transported via a 350-km route. High transport costs further squeezed already thin profit margins. "The saltworks could not be sustained without a direct road out," Wang said. In 1999, thanks to government efforts to tame the desert, a 115-km highway through the middle of the desert opened to traffic, but was quickly swallowed up by sand. Wang realized that to do any business in the desert, he first needed to deal with the sand. He renamed his company Elion, focused on curbing desertification and developed a business model to generate both economic and ecological benefits. The game-changer in his business model was licorice farming because licorice grows well in the desert and is one of the most profitable and widely used medicinal herbs in traditional Chinese medicine. Moreover, the plant works well in curbing desertification. The nodule bacteria living in the plant's roots have a nitrogen fixation effect which increases soil fertility. One licorice plant can help reclaim 0.1 square meter of desert land. "We invented a planting method where one licorice plant is able to reclaim 1 square meter of the desert, 10 times more than before," Wang said. Elion encouraged local people to grow licorice, providing them with licorice seedlings, training and other support. When they harvested the roots, Wang's company bought them at a fair price. 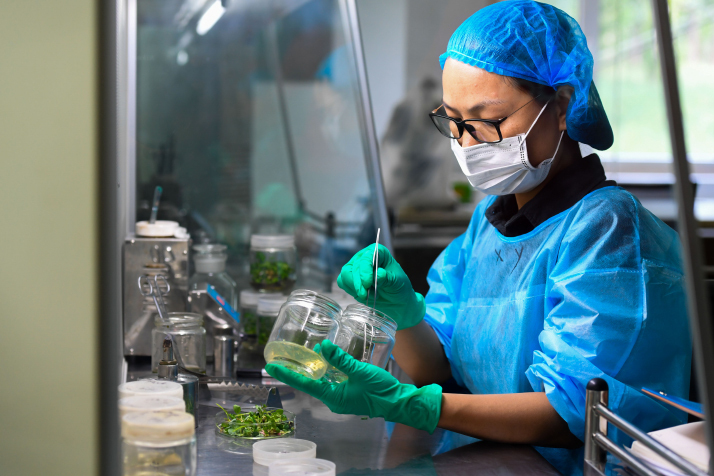 Through this business model, the desert turned green, local residents made money and Elion's desert business now covers six sectors including healthcare, environmental protection, clean energy, farming and livestock, tourism and feed processing. Through the efforts of millions of individuals and enterprises, China's fight against desertification has made significant progress. As shown in the latest national survey in 2015, the country's desert area shrank compared with a previous survey in 2010. To curb desertification, an essential part of the country's ongoing drive for environmentally friendly development, the government banned grazing on degraded grasslands, increased financial input and stepped up law enforcement in the sector. "We could not have made it without the government's supportive policies such as the grazing ban," Wang said. "We have gained useful experiences in dealing with sand, and we would like to share our experience with others." Elion now operates afforestation projects in arid areas such as Xinjiang Uygur Autonomous Region, Gansu Province and Tibet Autonomous Region. In December 2017, UNEP honored Wang and five other inspirational environmental leaders with the Champions of the Earth Award. "The challenge lies in promoting technological innovation to reduce afforestation costs and boost efficiency," Wang said. Elion has developed technology to plant trees via drones, taking less than a minute to deploy seeds with protective covers in a 667-square-meter area. The company is also working with the UK-based BioCarbon Engineering to develop a third generation of drones, which will improve the survival rate of seeds and drone performance, according to Wang. "Not all deserts should be treated, and only desertification caused by human activities can be reversed. Greening deserts is like a marathon. As long as there is a desert, my marathon will not come to an end," he said. Wang said his dream now is to introduce Elion overseas, to countries along the China-proposed Silk Road Economic Belt and 21st-Century Maritime Silk Road in particular, where the company's business model can help others in the fight against desertification.